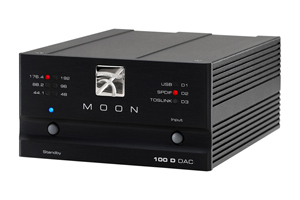 Lovely things come in small packages they say, well the littlest MOON dac is certainly true to form. Itâ€™s an ideal way to improve the sound quality of any computer, streamer or aging CD player. This little devil is fitted with 3 digital inputs (including USB) and can deal with all the sample rates and bits you can throw at it. The really special bit however, is that you still get a big helping of lovely MOON sound. A typically big, musically inviting portrayal of all your favourite records which is still something uncommon with many digital devices.